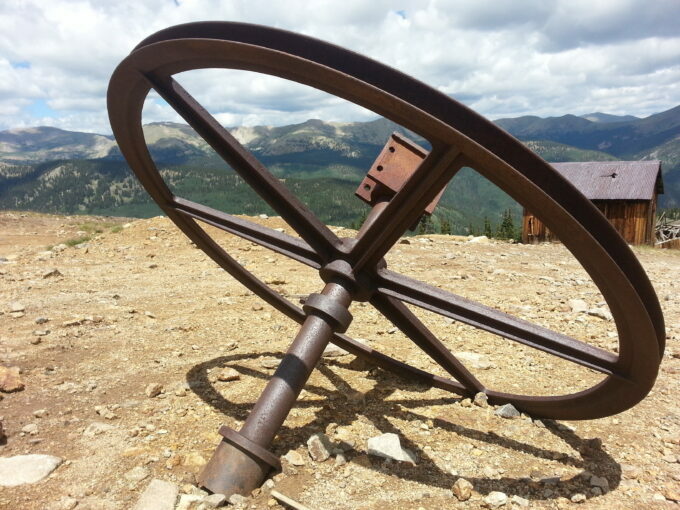 I was trying to focus on my driving along the narrow shelf road yet still look at the amazing scenery of the Colorado mountains, dotted with old buildings and mining camp ruins. 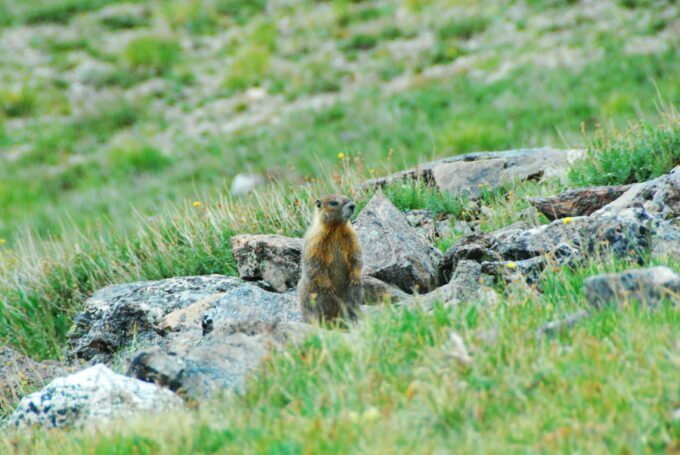 Yellow-bellied Marmots were chirping and calling to each other as we eased along in our Jeeps. You have to wonder how the miners of the late 1800’s got heavy equipment up and down these shelf roads. There was freedom in the air — a sense of just letting the time pass and the joy linger. 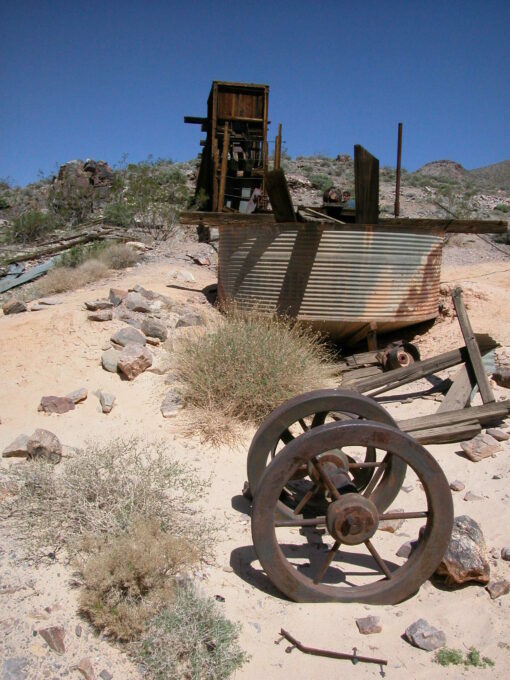 A huge historical mining camp was just ahead and me and my Jeep were free! 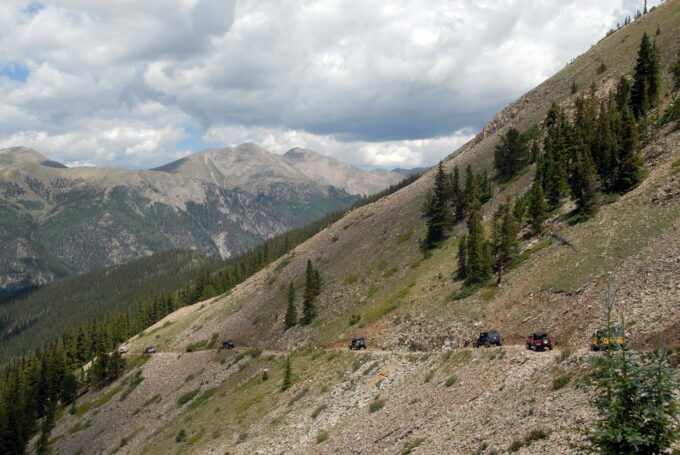 Some people call it “ghost-towning.” Others just say they’re out for a Sunday Jeep drive in cool places. A lot of Jeepers are doing this while geocaching as well. No matter. 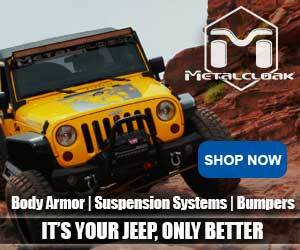 If it sets you and your Jeep free, then by golly, get ‘r done. On a Death Valley trip I found the remains of a miner’s claim from the late 1800’s where he’d left a dynamite box, some tools and artifacts from probably decades of hard work. I couldn’t tell if he really made any money from his claim, which looked like a good mine, but nonetheless, I was awed to be standing there where he had dug in the ground 150 years ago. My Jeep took me to all these adventures. It is a lifestyle I hope to never give up. 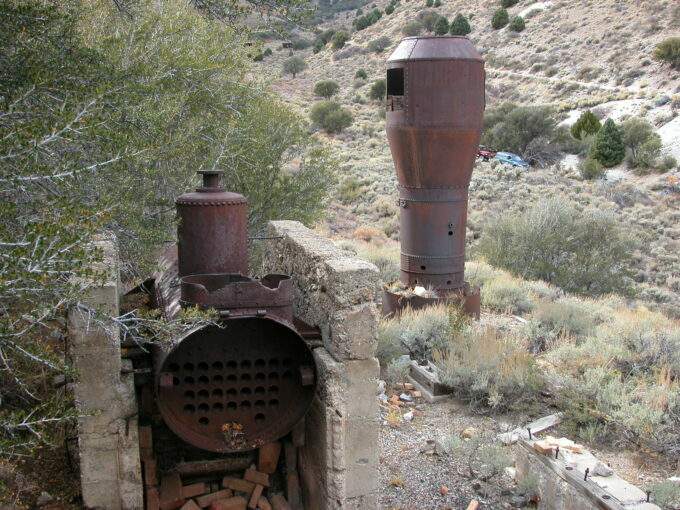 The internet is a vast source to search for old ghost towns and mining camps. 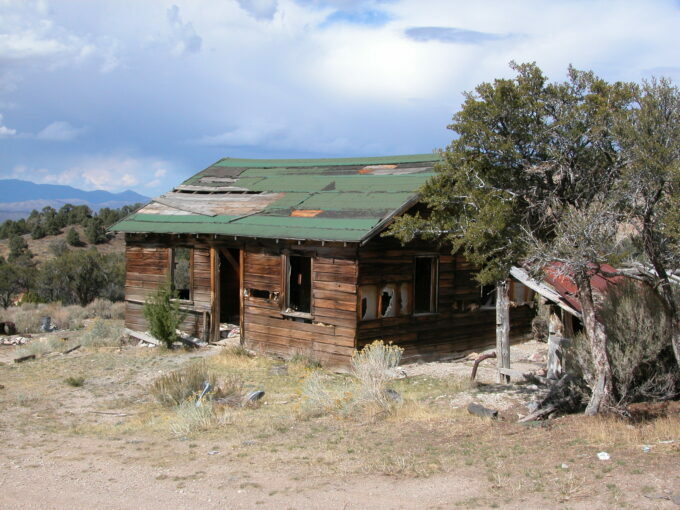 You can try a browser search with keywords: (your state):ghost towns. Also, a hard-copy topographical map will also show mining claims and buildings. So grab a friend, load up the Jeep, pack a good lunch, and go find some history! Stacie (wife) checks out a building from the Iron Chest Mine Site, built late 1800’s, and located nearly 12,000 up the mountain! You have to admire the miners and their determination. 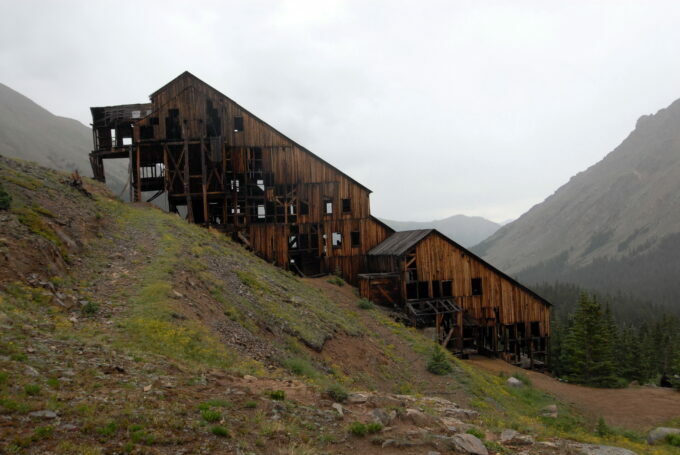 Inside the Champion Mine Mill, CO where machinery from the late 1800’s still has the scars of a tough life of mining for gold, silver and other ores. 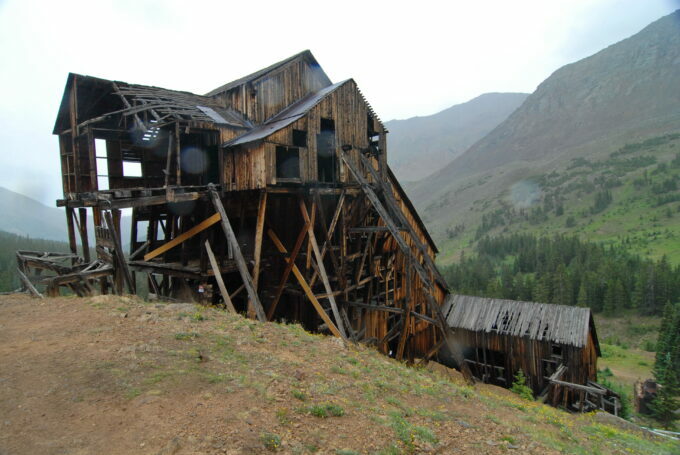 Champion Mine Mill on a drizzly day, about 11,000 feet up the mountain, built about 1890 and fizzled right after WW I when galena, silver, pyrite and even gold were not profitable to mine here under these mountainous conditions. 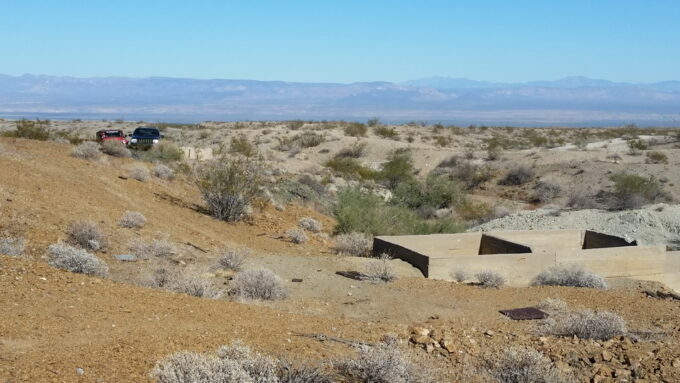 Foundations of mining activity in the Mojave Desert are probably from the days right before WW II. 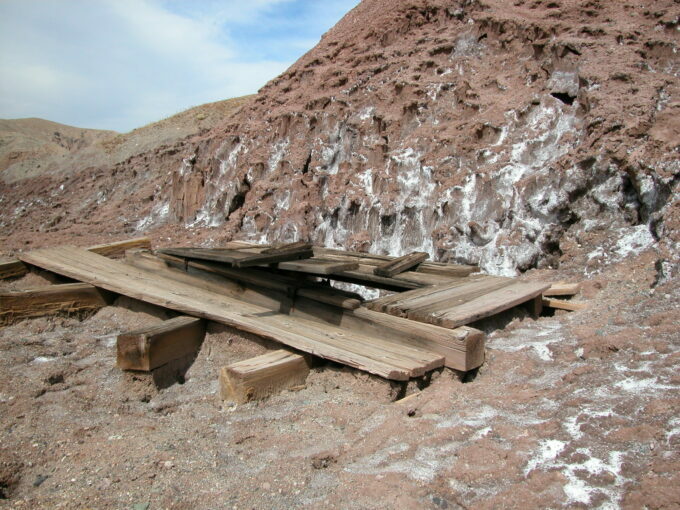 Death Valley has a lot of old mining remnants that you can Jeep to for days on end, like this loading chute at Ibex Springs. 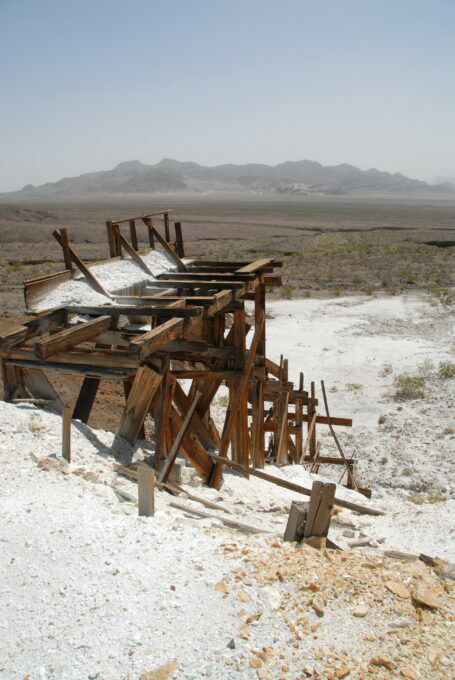 In Echo Canyon of Death Valley, you can explore the vast remains of the Inyo Mine. 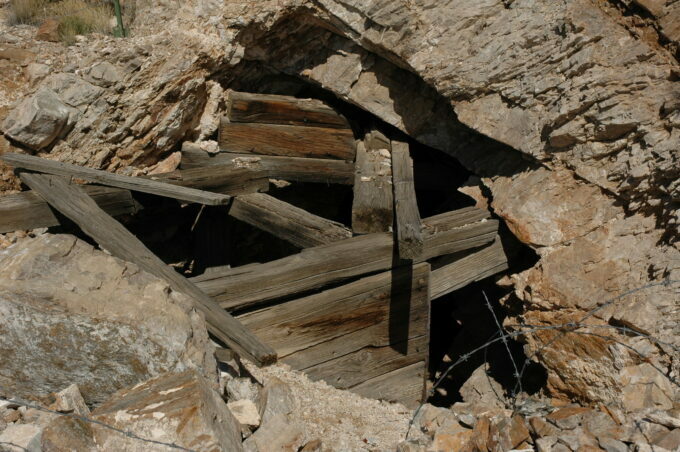 Mines that are closed up with old wood (shoring) like this are probably best left alone — stay out and stay alive. Stay out and stay alive! 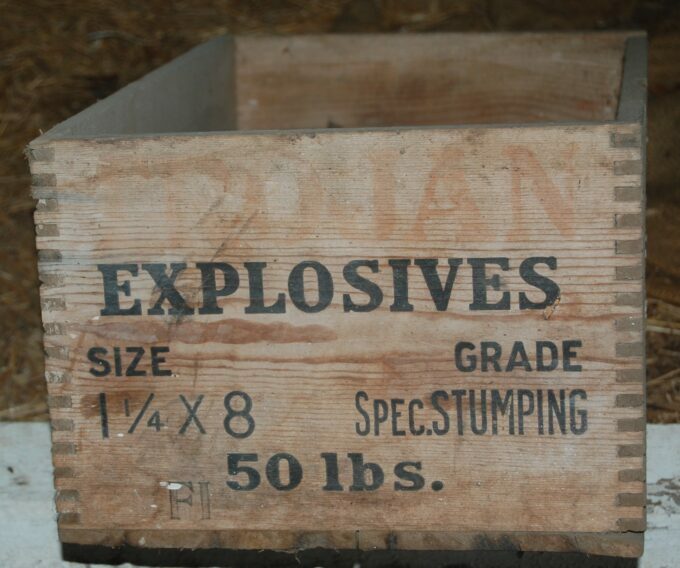 It’s really special to find old mining debris like this dove-tailed dynamite box. Take a pic and leave for others to enjoy. These old miners weren’t much on chatting. The locals call them the Junk Yard Gang or the Auto Parts Gang. They’re near Elko, NV on a long dirt road in the middle of no where. Somebody tried to make a living here. 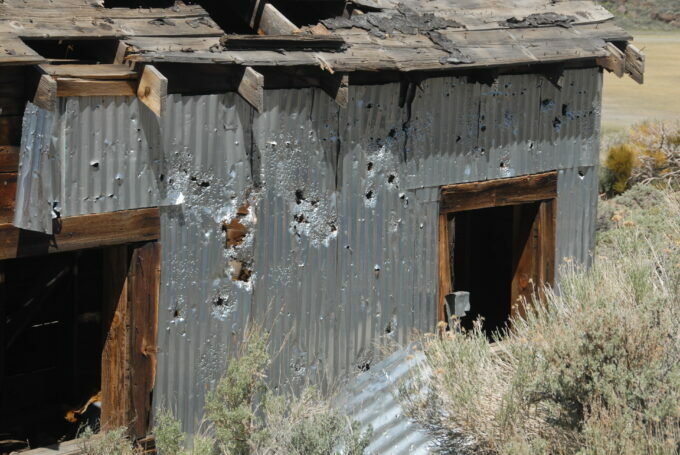 Some of the cabins near Wells, NV that I found were made from old rail road ties. 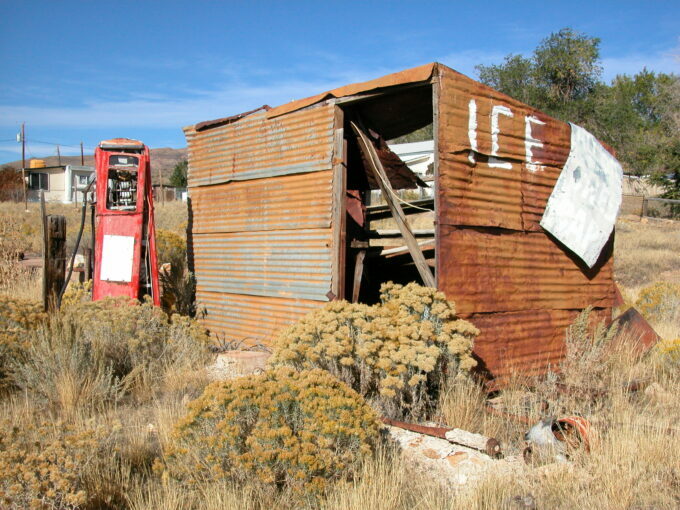 What remains of Deeth, NV outside Elko. 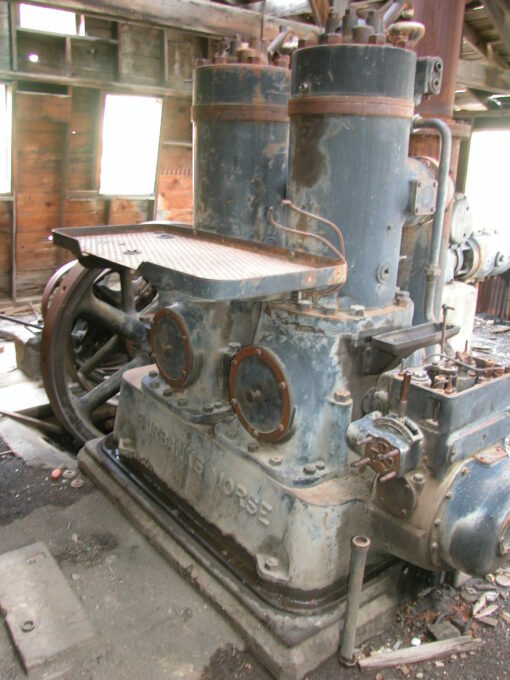 One of the most famous names in compressors and pumps, the Fairbanks Morse from Kansas City. 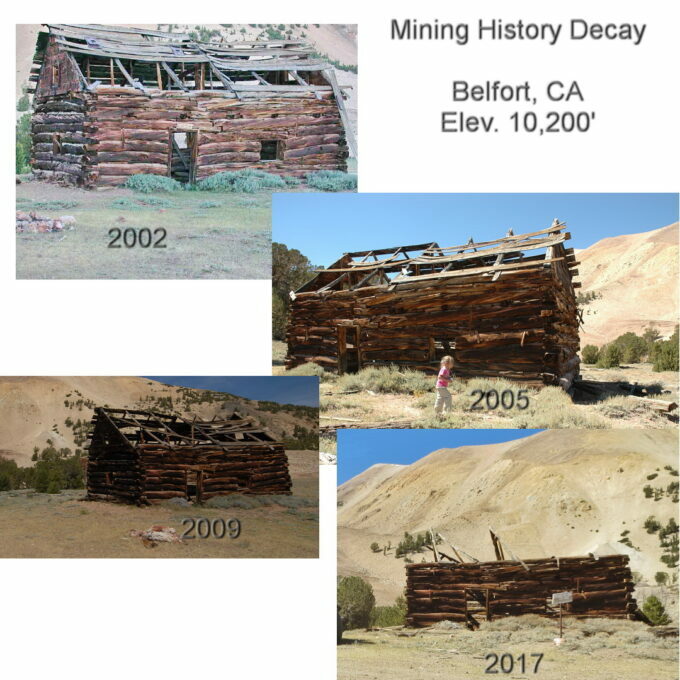 “Arrested decay” is what land managing agencies will sometimes do to historical places like the ghost town of Bodi, or in this case the Champion Mill Mine in CO. Newer lumber and supports are meant to slow down (arrest) the deterioration. 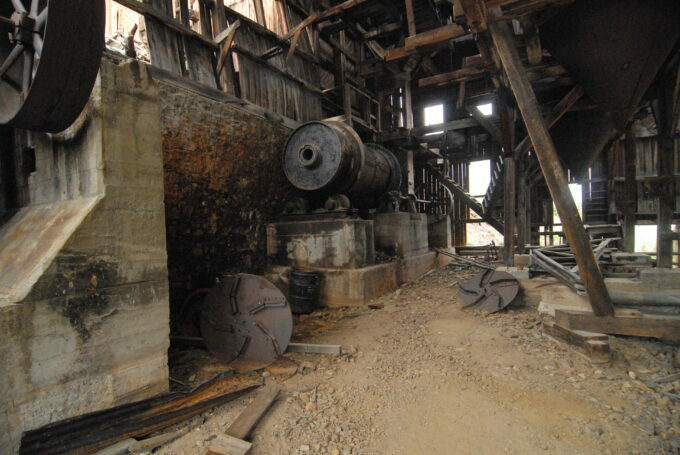 Conveyor belt wheel, Iron Chest Mine. Shameful vandalism of an old mining camp building. There is no reason on God’s green earth for vandals to practice their shooting on historical buildings or old mining camps on public land. 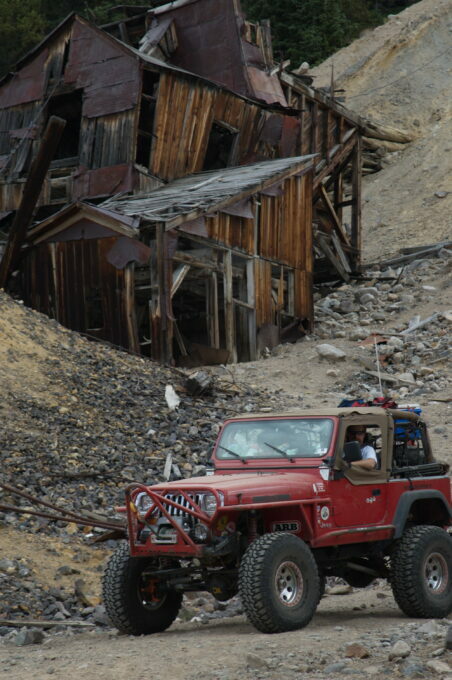 My buddy Jerry Sparkman Jeeping for fun at All-4-Fun in CO.
Mining camp store from the 1880’s, the ghost town of Belfort, CA. 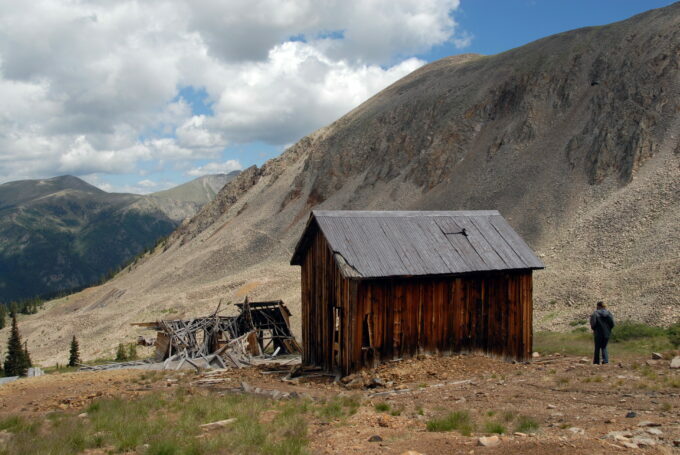 NOTE: I highly recommend finding and seeing ghost towns and mining camps from the 1800’s now — while they still stand. Nothing lasts forever. Mamma Nature takes her toll over the years. Internationally published author; WorldWide ModernJeeper Abassador and 2014 Inductee of the Off Road Motorsports Hall of Fame. Del has been involved in the Jeeping Lifestyle for longer then most of us can count. His educational and mentorship programs have helped developed warfighters in the ongoing battle to keep Public Lands Open to the Public. 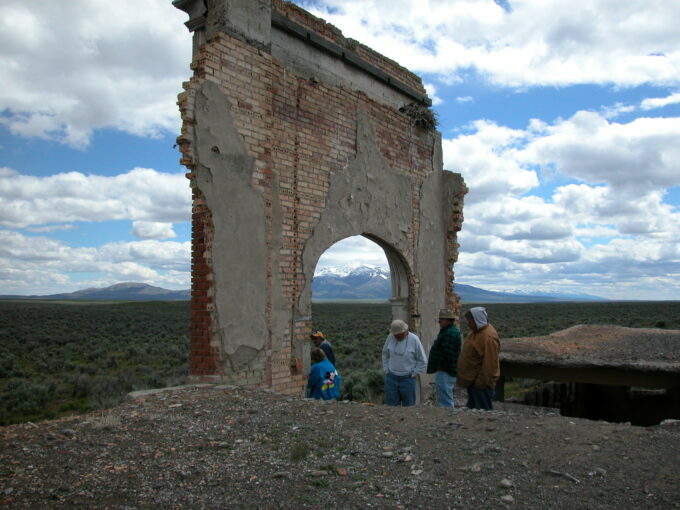 Great insight on ghost towns. Even today, in places in Iowa, Indiana, and Texas, ghost towns exist. As a country grows so does the economy and many times the culture changes which results in people leaving the place they live to find a place with jobs. Mines pay out, lumbering is curtailed, and small farms morph into large farms operated by corporations. 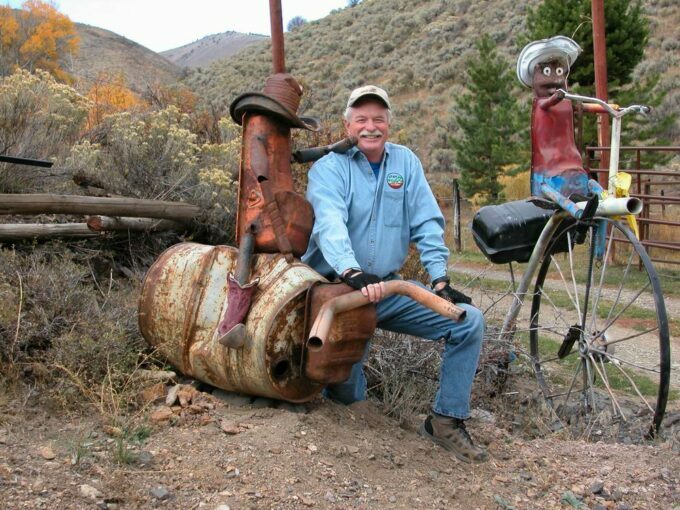 I lived in Gunnison, CO for a number of years in the early 1970’s. 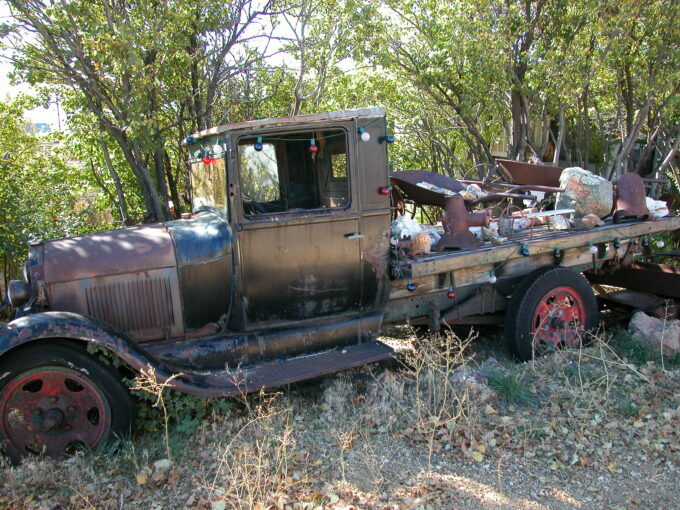 Great place to start out for hunting for old places like mine sites or old townsites. Above Gunnison is Lake City, which is a partial ghost town; today many people own properties so they can enjoy the summers. 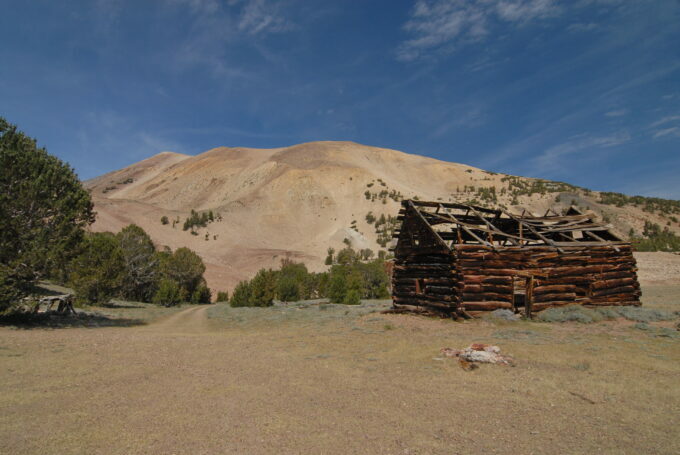 Most National Parks also contain the remnants of ghost towns or old mines. Talk to a Ranger to find out where they are located. In the 4 corners area of CO, NM, AZ is the largest “ghost town” I’ve seen; many know it by it’s current name of Mesa Verde.